This converted former stable sleeps two people in the village of Henstridge which sits on the border of Dorset and Somerset near the towns of Sherborne and Shaftesbury. Frodos is a single storey, self contained annexe to the rear of the owner's home in a quiet lane in the village of Henstridge near to Sherborne. With one double bedroom and a bathroom, it is ideal for a couple as the cottage also contains a small fitted kitchen and a sitting room with a dining area. To the outside of the cottage is shared use of 3/4 acre of lawned garden with a large patio area, garden furniture and a BBQ. Located near to the border of Dorset and Somerset, Frodos is a lovely cottage for a couple wishing to explore this part of the country. Amenities: Storage radiators with electric panel wall heater in bedroom and heated towel rail in bathroom. Mini electric oven with two-ring hob, microwave, fridge/freezer, use of owner's washing machine by arrangement, TV, CD player/radio, WiFi, library of books. All fuel and power inc. in rent. Bed linen and towels inc. in rent. Travel cot available on request. Roadside parking available on either the cross or street opposite the house. 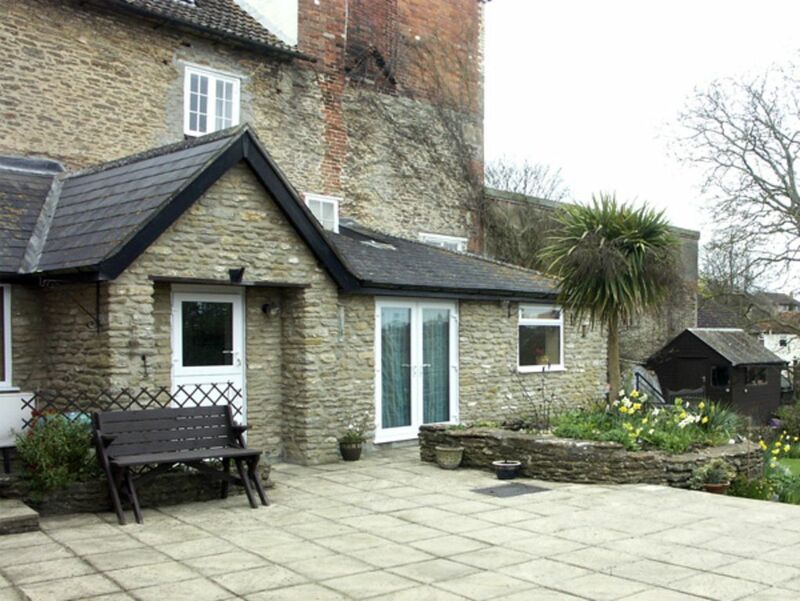 Shared use of 3/4 acre of lawned garden with large patio area, garden furniture and BBQ. Sorry, no pets and no smoking. Shop 1 min, pub 3 mins. Note: This property is suitable for 2 adults and 1 infant only. Note: WiFi signal can be low. Town: Henstridge lies in the extreme south of Somerset and it's parish is separated from Dorset by Landshire Lane. Its name comes from the Olde English word 'henst', meaning 'horses' and translates as: "the ridge where stallions are kept". The ridge is the narrow strip of Jurassic limestone that runs through Henstridge and the nearby villages of Yenston and Whitechurch. Henstridge has an attractive church, which was consecrated in 1332. Unusually it has four altars.Â The porch was added in the 14th Century and the north aisle was built in the 15th Century. Nearby, you can explore a number of properties in the care of the National Trust, such as Stourhead House and Gardens and the historic town of Shaftesbury. Britain's most famous stone circle, Stone Henge, is only a short drive away and the Dorset coast offers the best of coastline and countryside. All ground floor. One double bedroom. Bathroom with a walk-in shower, basin and WC. Small fitted kitchen with adjoining room containing fridge/freezer. Sitting room with dining area and patio doors leading to garden. Storage radiators with electric panel wall heater in bedroom and heated towel rail in bathroom. Mini electric oven with two-ring hob, microwave, fridge/freezer, use of owner's washing machine by arrangement, TV, CD player/radio, WiFi, library of books. All fuel and power inc. in rent. Bed linen and towels inc. in rent. Travel cot available on request. Roadside parking available on either the cross or street opposite the house. Shared use of 3/4 acre of lawned garden with large patio area, garden furniture and BBQ. Sorry, no pets and no smoking. Shop 1 min, pub 3 mins. Note: This property is suitable for 2 adults and 1 infant only. Note: WiFi signal can be low.